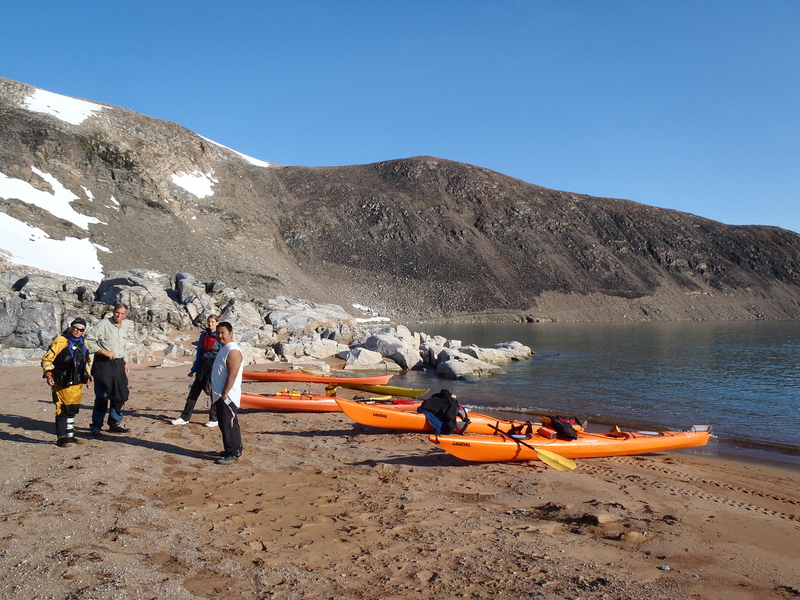 In Ittoqqortoormiit, kayaks aren`t used for hunting any more. 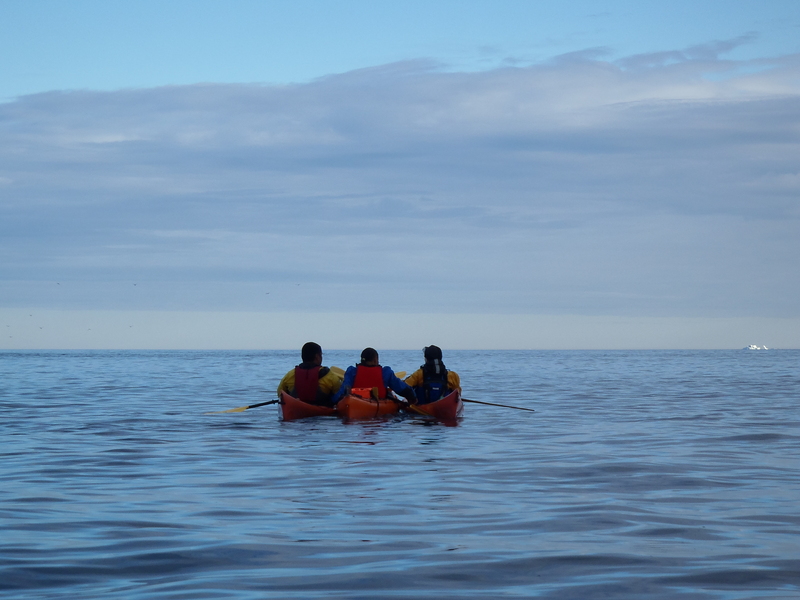 But, during the last couple of years, quite a few people in the community have developed an interest in using kayaks for recreational means. 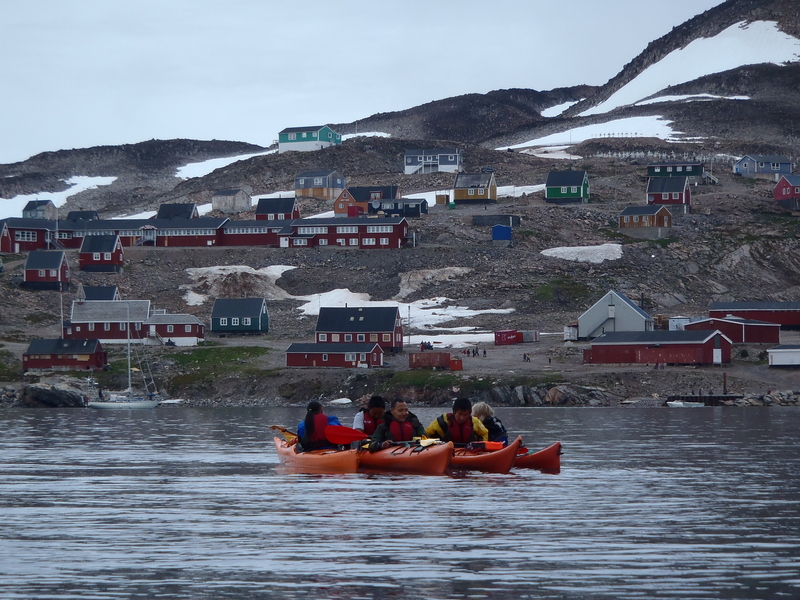 Thanks to Destination Eastgreenland and Nanu Travel, providing the equipment needed and an instructor willing to teach us, there has been a week-long paddling/safety course each summer, since 2011. This year, the main focus of the course was to equip the paddlers who already had some experience, and had been participating in previous years, further more. So that we, in the future, would be able to work as kayak guides, and to teach others in the community about kayaking. Susanne Jars, “our” inspiring kayak instructor (she`s been coming back to teach us every year), close to Kap Tobin. 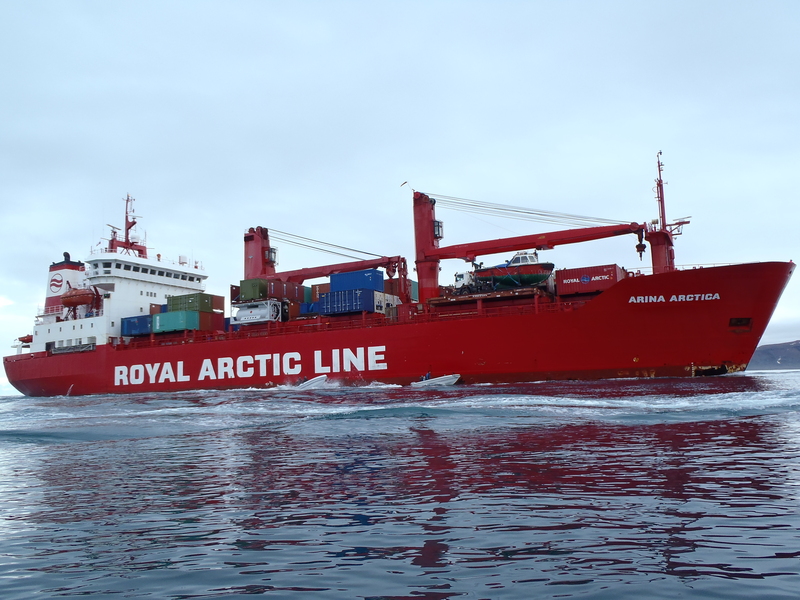 On the evening of august 4th, the first supply ship was expected to arrive in Ittoqqortoormiit. We were planning to paddle out to great it. It was due to arrive at about 7 pm. We weren`t the only people out there! Many motor boats, with both children and adult passengers, were circling around the ship, celebrating the fact that the supermarket would soon be stocked with fresh and exciting food. 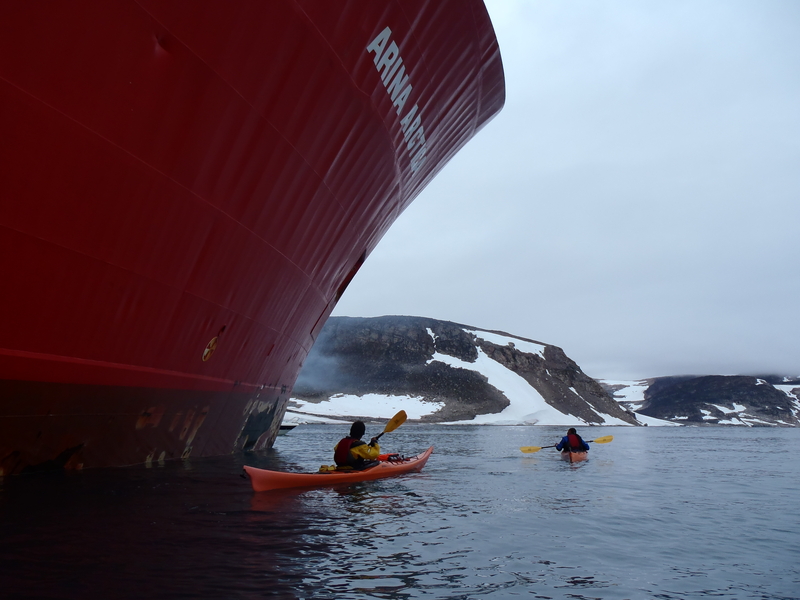 After the “Arina Arctica” and its waves had passed by, we paddled back to take a closer look at the ship. 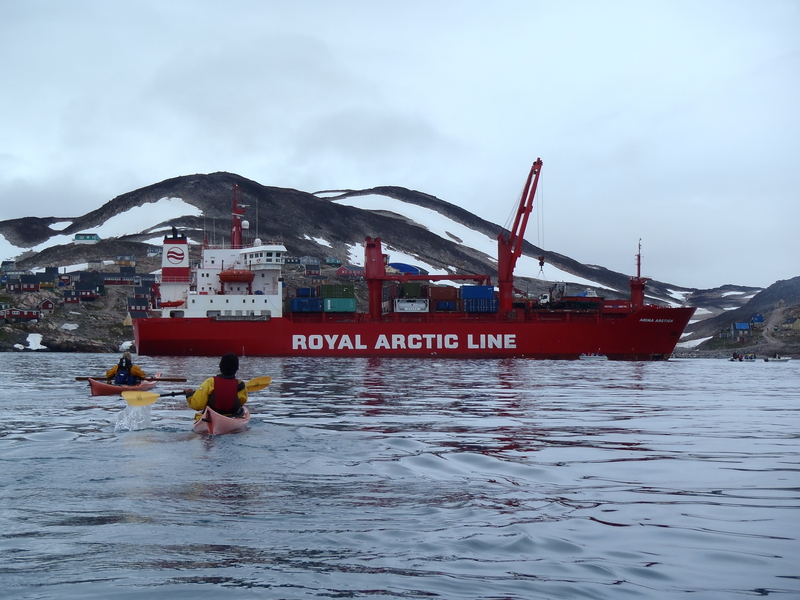 We felt very small in our kayaks, – as if we were passing by a giant. For the next 2 days, there would be a few more vehicles in town. These trucks drive the containers from shore to the warehouse and around town. The boat in front of the ship is used to transport the containers to shore. We coudn`t help but admiring the giant for some more time. 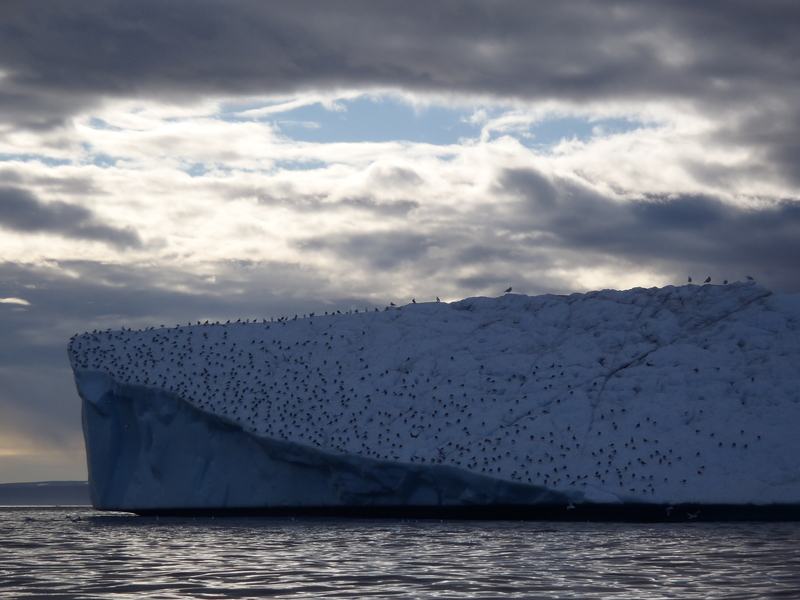 The following afternoon, some of us got the chance to guide tourists on a trip to Walrus Bay, supervised by Susanne. It was a great opportunity to put into practice what we had learned so far. 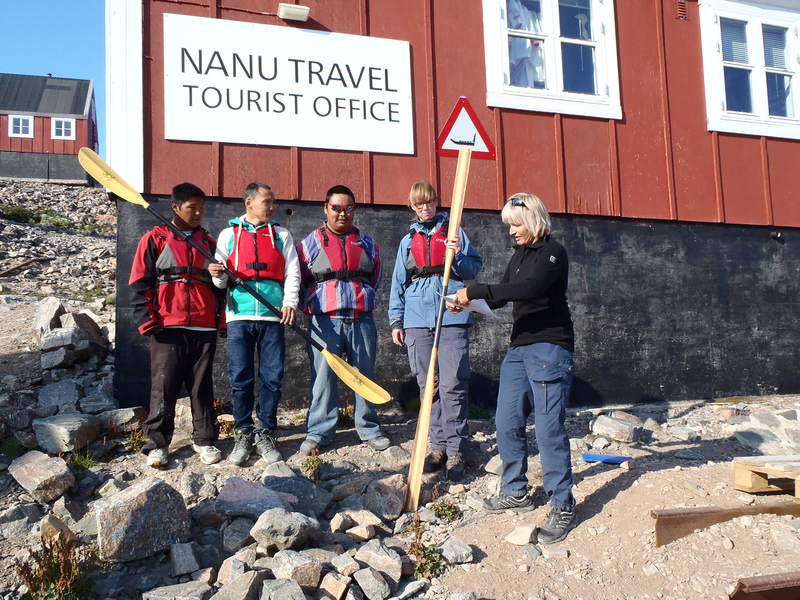 In front of the tourist office, Susanne handed out diplomas to the participants of this years kayak course (some are missing, since they had to be at work). We now are 4 people (3 of them are in the picture) in Ittoqqortoormiit, who have reached EPP4 (European Paddle Pass Level 4). After an intense week, working at daytime and kayaking in the evening, we felt relieved to have passed the test and reached our goal. Well done Ruth! I hope you did it all in the beautiful kayak you made. Thank you, Yvonne! 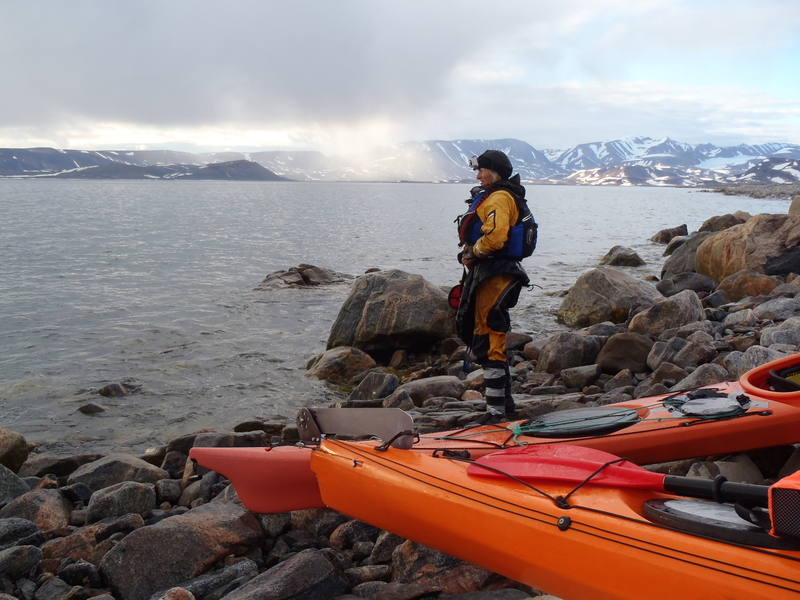 This year, for the first time since 2007, I´ve been paddling in another kayak, not in my own. 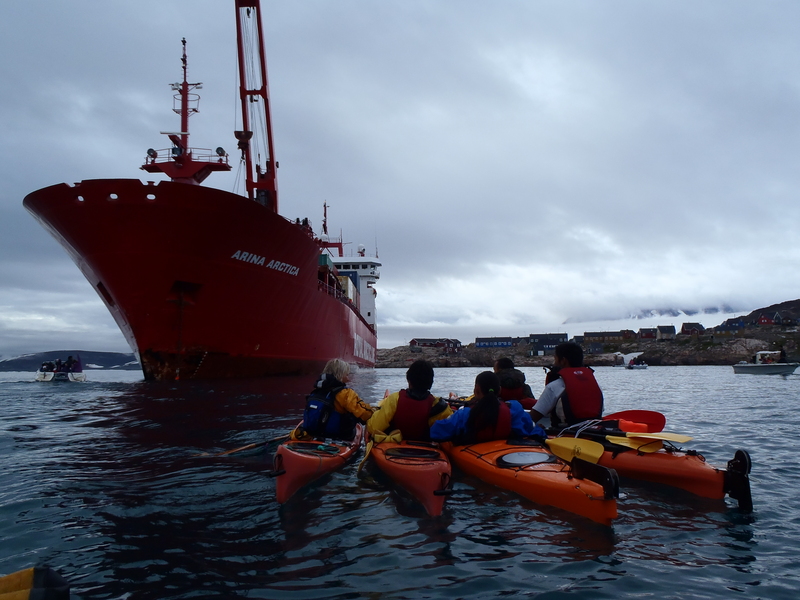 Nanu Travel`s plastic-kayaks are so much heavier, but you can be more rough on them, and that`s good when you are out with tourists and have to be there “for them”. 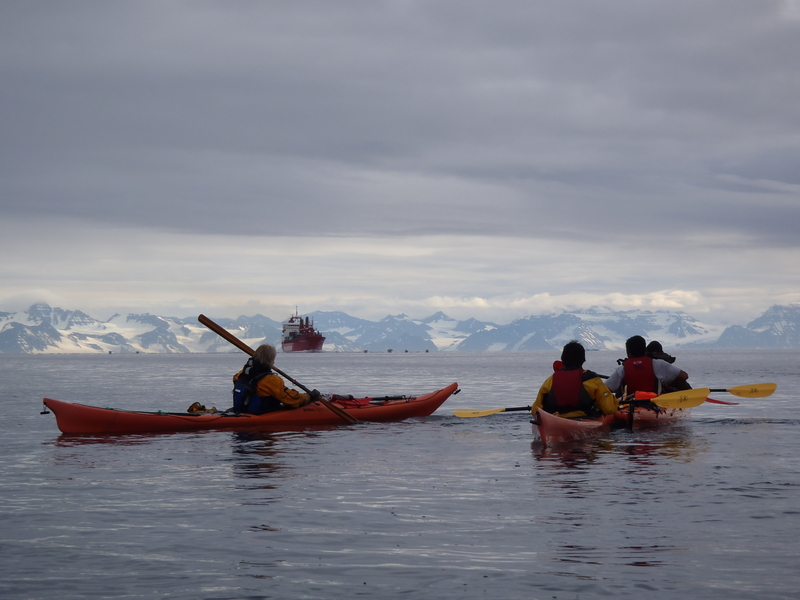 – I still love the feeling of sitting in my very own greenlandic kayak. It just requires some more care and time – for instance to get in and out of it in rough weather at a stony coastline, – since it fits me like a shoe :-). Wow. 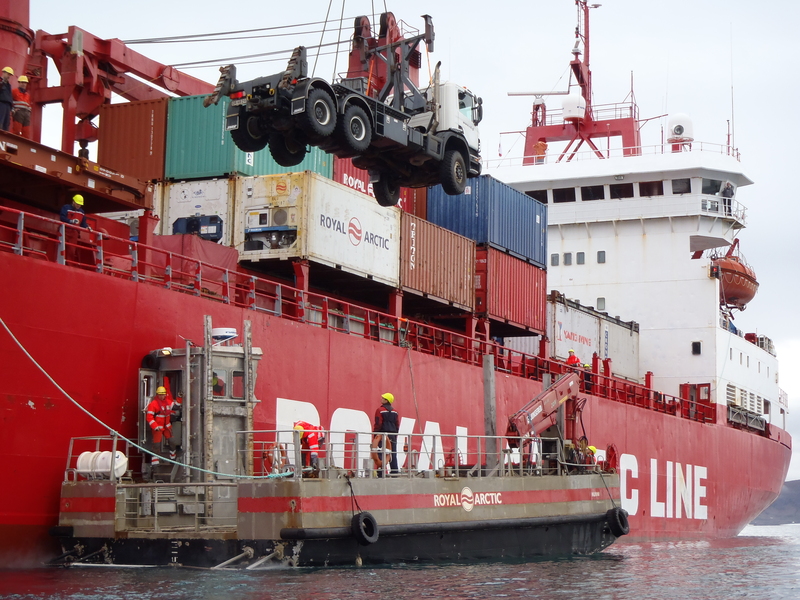 I knew that stuff had to come in on container ships but it never occurred to me that they would have to bring their own trucks to make deliveries. That must be a very busy time. Do a lot of people get temporary work helping unload and inventory the shipments so the containers leave with the freighters? I’m sure they don’t want to stay in port anytime longer than necessary. For that matter, do the shippers either bring a temp labor staff or let crew members hire themselves out to expedite delivery and inventory of goods to customers? Do you have a celebration or festival when the ship come in. It looks like a good time to add some “tourist” income and stimulate the local economy by having a party of sorts. Kind of like farmers having fall harvest celebrations when food is plentiful. I was noticing in the wide shot of the village that almost all roofs are the same color and there are only 3 or 4 colors the buildings are painted. Is there some historical or cultural significance behind that? As far as I know, there`s no historical or cultural significance to this. When it comes to the roof, I believe that the material used is what works best in this environment. The houses are painted in many different colours, although some colours are more popular then others. That depends both on what colour the owner prefers, and on what colours are available locally. Some companies prefer to paint all their houses in the same colour. Should I infer from this there is an inordinate amount of renting as opposed to owning there, like the coal towns in the American Appalachian region used to be? When you say companies do you mean companies that own properties for the sole purpose of renting, like a developer, or housing supplied by employers to their employees? I’m just trying to get an understanding of the economy or your town. It would seem that you really don’t have a mega employer unless there is a seafood cannery or something of that nature, or a government installation of some sort. It seems like the economy there would be very delicate and easily thrown out of balance. That is of course true of anyplace, but it seems the rebound options would be fewer there and be longer taking effect.